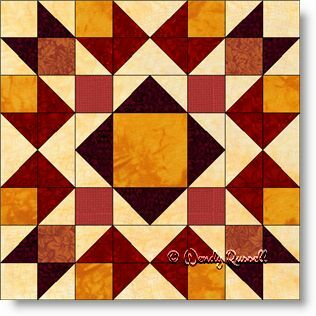 The Arrow Crown quilt block has no difficult patches in the block. However, do to the large number of patches required to make the block, I have assigned this quilt block to an intermediate level of difficulty. For this sample, I decided to use a gradated range of colours, so you will see a selection from a pale yellow to a deep burgundy in these fabrics. The sample quilts illustrated show the quilt blocks on point and also side-by-side with sashing. This can give you an idea of how many different looks you can achieve by simply using your imagination with how to set the blocks in your own quilt.